In the 1950s, a connoisseur of fantastic flavor named ‘Jumbo Jim’ made waves in the town of Mandan, North Dakota, by offering a Sloppy Joe at his Drive-In that kept customers clamoring for more. Children and adults alike offered their votes of approval as this sauce became a sensation in the state capital’s sister city. Today, the sauce is available at your local grocer or right here on our website in a 14-oz jar, bringing Jumbo’s classic, unbeatable taste directly into your home. 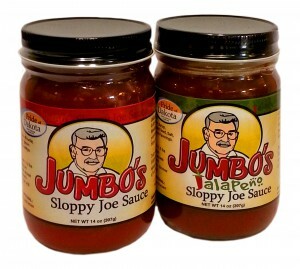 Jumbo’s Original Sloppy Joe Sauce and Jalapeno Sloppy Joe Sauce provide a mouth-watering kick to an array of your favorite dishes. Whether you are entertaining friends and family, or need that perfect comfort food to add to your next party, Jumbo’s Sloppy Joe Sauce is a proven winner!